The boy that never grew up had some fabulous adventures in his incredible ship and now you can appeal to your childs sense of adventure with the Peter Pan Blue Ship Lampshade. 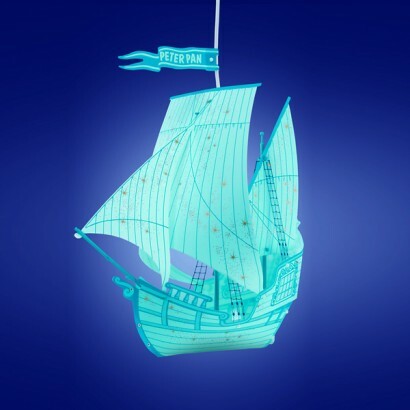 The Blue Peter Pan Ship has stars on the sails, and each large lamp shade is made out of tough, lightweight plastic sheets that are part assembled so that all you need to do is position the front sail and mainsail for it to be ready to hang. A ceiling rose fixture is included with enough cable to suit very tall rooms, or you can trim it down to keep the ship high in the sky. Supplied with ceiling rose and assembly instructions, this light fixture requires installation by someone competent in electrical installation. Consult a qualified electrician if you are in any doubt. Cable, ceiling rose and fitting instructions included. Always consult a qualified electrician if you are uncertain about electrical installation. Absolutely delighted with the product ! Fast and efficient service and the gorgeous Peter Pan light ship will look amazing in my grandsons nursery . Would definitely recommend this product ! My son was thrilled with his light. I was worried it would look 'plasticy' but I was pleasantly surprised it looks great and gives a lovely blue glow to the room. Well worth the money. Just gorgeous! Bought this for our nautical themed nursery. Arrived in less than 24 hours! The cable is very long but is easily adjustable and was fitted easily by my boyfriend. We love it!! I got this for my sons' pirate-themed room (I just left the Peter Pan flag off), and they decided it's a ghost ship. They both love it, as do all the adults who see it! I must admit I'm jealous too.